“I want to just make music (...) and really I don't know how I would do it without your products. “I'm absolutely pleased with the BomeBox. It's doing everything I hoped it would do and feels very reliable. “We use the BomeBox as the central routing interface for all rehearsals and performances in our theater. So the question is not if you need a BomeBox at all. The question is: how many? 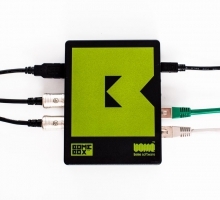 “BomeBox...haven't seen that kind of ingenuity since the early MIDI days. “The BomeBox is the best MIDI tool I've ever owned. It served me right on Nine Inch Nails and now I take it with me to every gig. As I know, I can trust it. You can use standard cell phone power banks to power the BomeBox for days. Access the Web Config from any smartphone, tablet or computer with WiFi. Download product photos in high quality: BomeBox_Photos.zip. 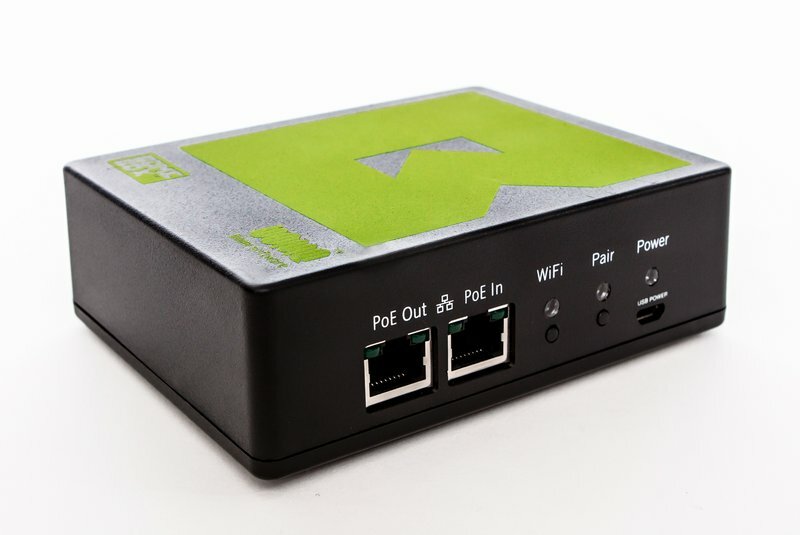 To configure the BomeBox, simply connect any computer, smartphone, or tablet to the BomeBox’ built-in WiFi and invoke the web config in a standard browser like Safari, Chrome, or Firefox. The overview page of the Web Config shows how many MIDI routes and MIDI ports are available, which MIDI Translator Pro project is selected, and more. 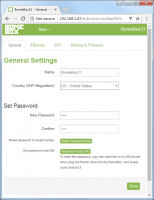 In the General Settings, change the name of the BomeBox, set the WiFi country and change the password. 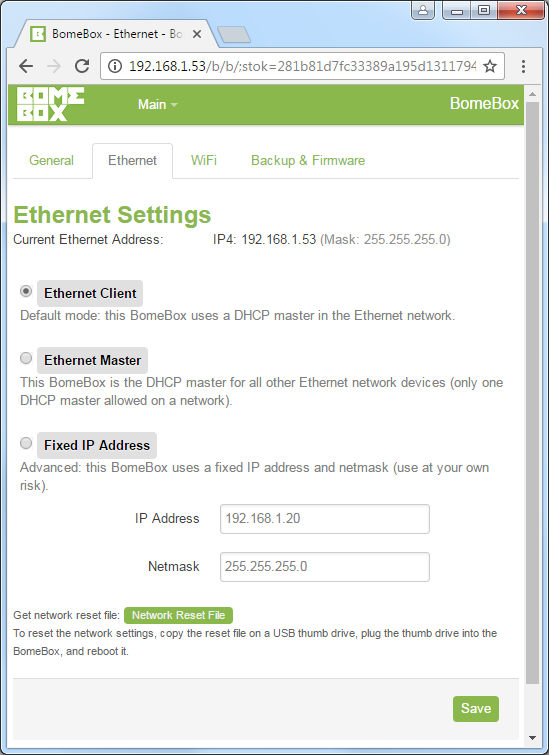 In the Ethernet Settings, configure the BomeBox Ethernet as a Client, a Master (DHCP server), or with a fixed IP address. 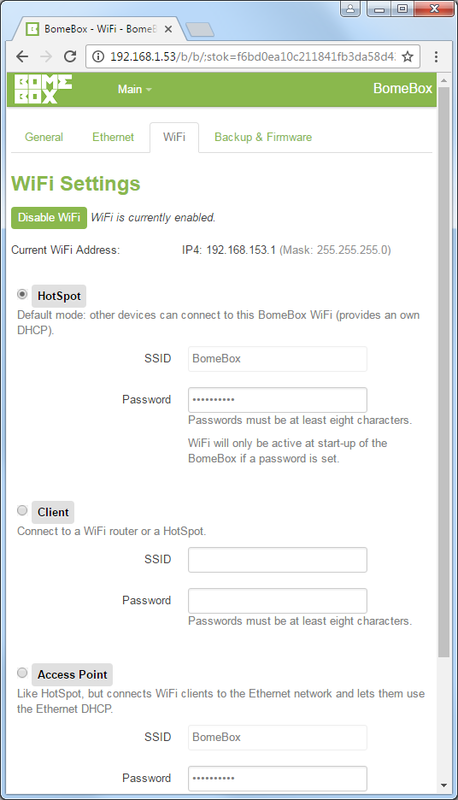 The WiFi Settings allow you to configure the BomeBox WiFi as a HotSpot, a WiFi Client, or as an Access Point. 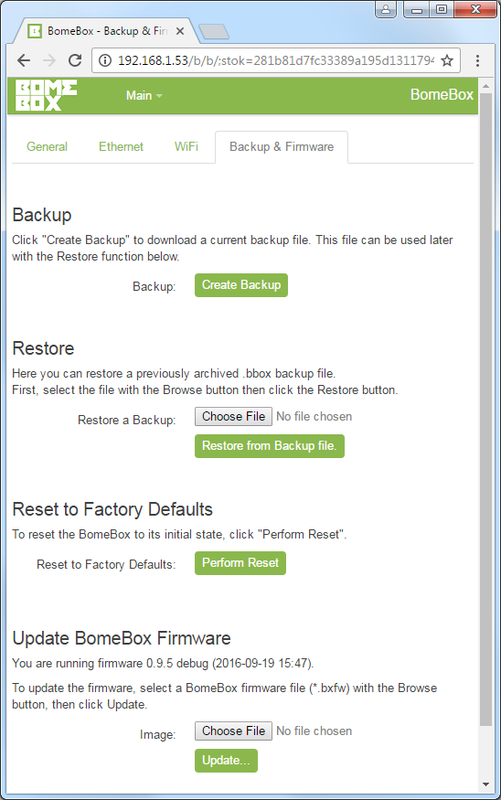 On the Backup&Firmware page, you can create backups of the BomeBox configuration, and install a firmware update. 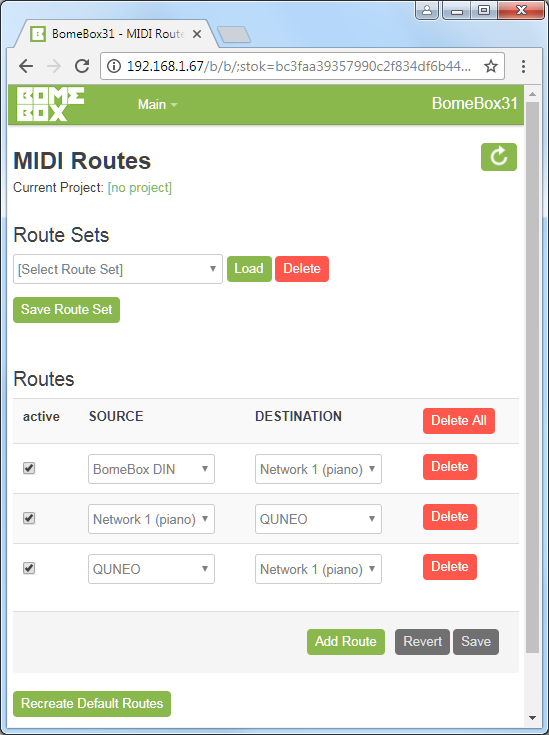 On the MIDI Routes page, you can create any number of MIDI Routes, i.e. virtual MIDI cables from a MIDI IN port to a MIDI OUT port. 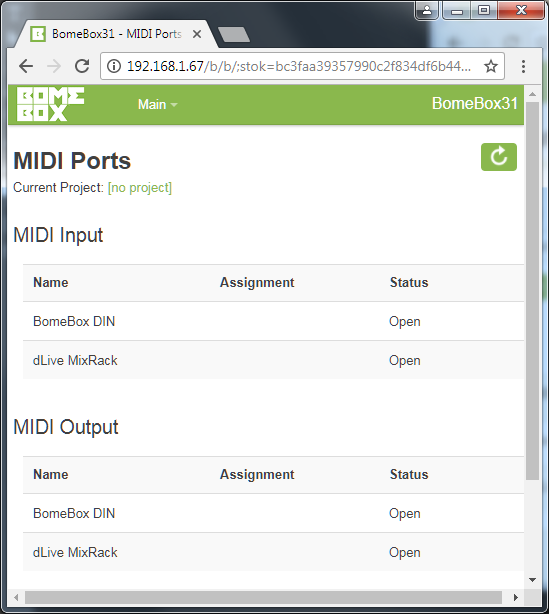 On the MIDI Translator page, you can select and upload a MIDI Translator Pro project to run on this BomeBox. Bome MIDI Translator Pro is sold separately. 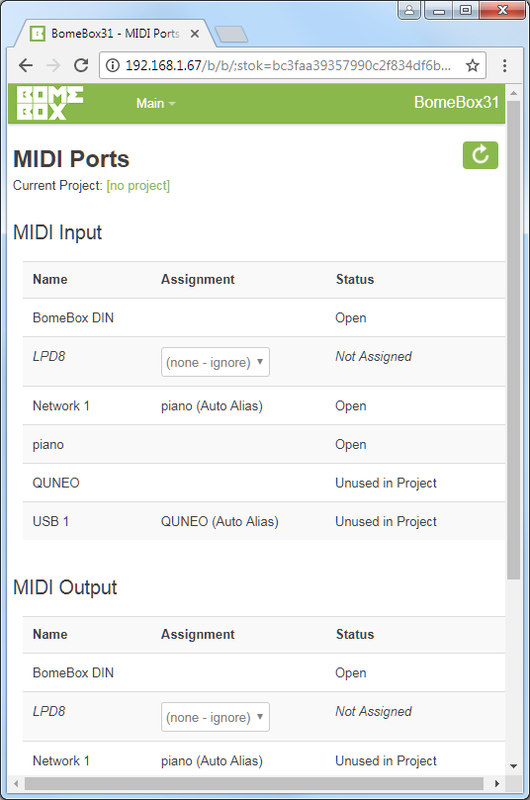 The MIDI Ports page lists all MIDI ports and MIDI aliases. If a MIDI Translator Pro project uses an unknown MIDI alias, you can assign it to an actual port here (in this example, the LPD8 alias is not assigned). 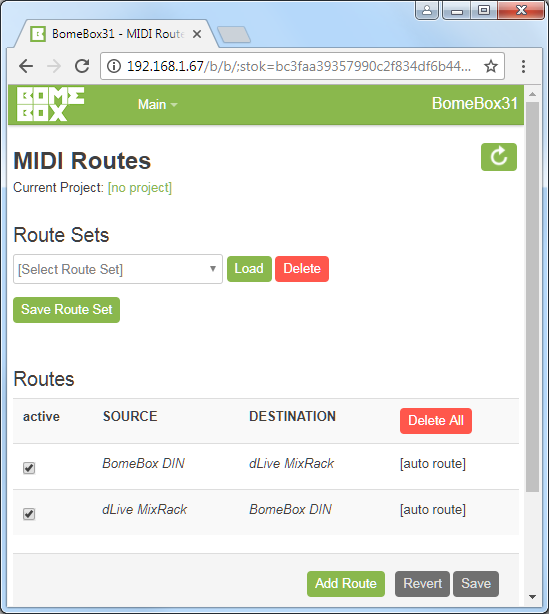 On the Network MIDI web config screen, you manage network connections to other BomeBoxes, or desktop computers and mobile devices running the Bome Network connector app. 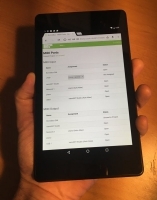 How the web config looks like on a tablet (easily connected via WiFi). How the web config looks like on a smartphone (easily connected via WiFi). On the Allen & Heath page, you can enable professional mixer support. Discovered devices automatically appear in the list. When enabled, a connected Allen & Heath mixer's MIDI port will be routed to the MIDI ports of the BomeBox. You can enable/disable such automatic routes as needed. The Allen & Heath mixer MIDI connection can be used like any other MIDI device. The mixers can be used in MIDI Translator Pro projects, too. We recommend to always upgrade to the latest firmware. If needed, you can also downgrade as you like. After a short while, you should see a verification page. You can use it to compare the MD5 checksum to the one displayed next to the download below. Wait until the BomeBox restarted and the power LED stops blinking. That first restart after a firmware upgrade takes approx. 2 minutes. These clips were recorded at the Bome booth at the NAMM Show. You can also watch the clips on YouTube. Many thanks to Nan of the midifan.com (Chinese) and to Sean Pappalardo for recording these video clips! Where can I purchase the BomeBox? 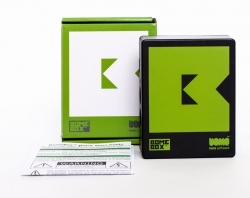 We sell the BomeBox from our web shop and ship to almost the entire world. US orders are shipped directly from our warehouse in Washington. As we grow our distributor network, the BomeBox is also available in more and more local stores and online shops. Can I connect a USB-MIDI device and a 5-pin DIN MIDI device and they work together? Yes, that’s standard functionality. By default, all ports are forwarded to all other MIDI ports. But in the web config, you can define fine grained MIDI Routing. Can I use one MIDI controller to control 5 other devices? Yes, the web config allows unlimited routing, duplicating and merging of MIDI ports. And in conjunction with MIDI Translator Pro, the BomeBox will do all the filtering, mapping, translation, and processing you can dream of. Can I have more MIDI DIN ports? Yes, just use a USB to MIDI adapter. We recommend high quality MIDI adapters from e.g. Roland, or Yamaha because we have seen MIDI data loss with cheap MIDI adapters. Use multi-port adapters or a USB hub to get even more MIDI DIN ports. Does the BomeBox support MIDI System Exclusive? Yes, the BomeBox supports any valid MIDI message. For mapping e.g. control change message to Sys Ex (or vice versa), use a MIDI Translator Pro project (see below). Can I use the BomeBox to map channels or controller response? Yes. For such processing functionality, use a MIDI Translator Pro project (see below). 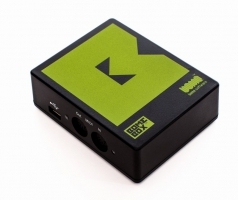 Does the BomeBox supply MIDI phantom power for MIDI powered devices? Yes. 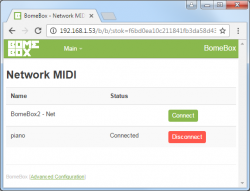 The BomeBox implements the latest version of the official MIDI spec. Does the BomeBox power USB devices? Yes, the BomeBox provides up to 1A at the USB Type A port. Can I attach multiple USB-MIDI devices? 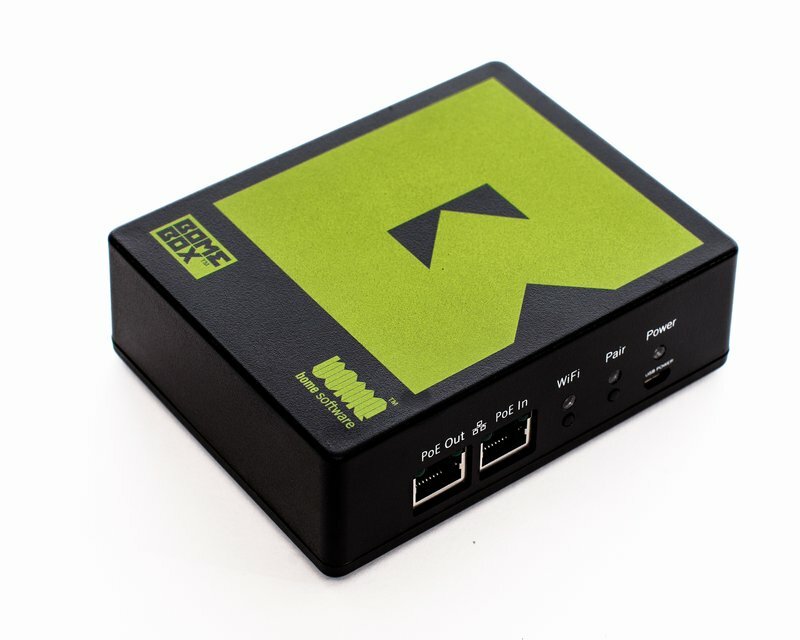 Yes, the BomeBox supports powered and passive USB hubs. 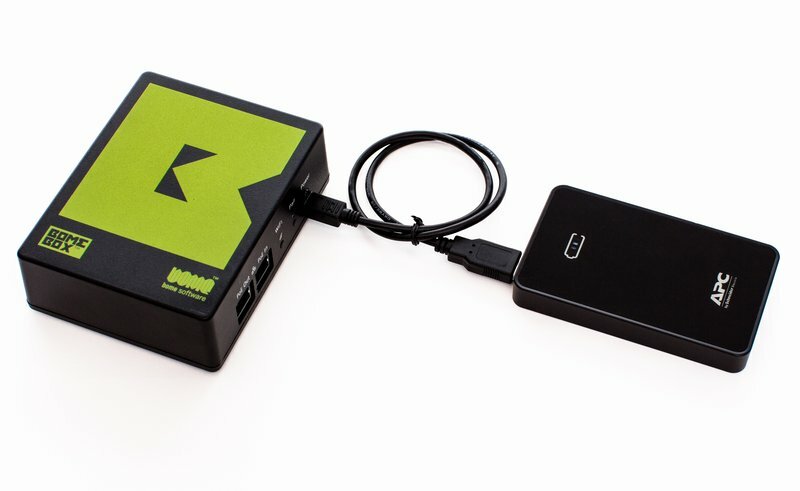 Does the BomeBox expose MIDI ports on a computer when attached using the Micro-USB connector? No. The Micro-USB connector is for power only. You can use Ethernet or WiFi for connecting to a computer: see section Connections below. Which kind of MIDI Processing is available? The BomeBox comes with very powerful capabilities for MIDI mapping, translation, filtering, routing, math calculations on values, conditional logic (if this then that), layers. Organize your translators in presets, apply your translators to specific MIDI devices or note ranges, and much much more. How do I create MIDI Processing Rules? MIDI Processing in the BomeBox is handled via MIDI Translator Pro (see below). You create and test your processing rules on a computer (Windows or macOS) and then upload the translation project file into the BomeBox. There, the translations run standalone. How many Processing Rules can I use in the BomeBox? The BomeBox has approx. 8MB memory for your MIDI processing / MIDI Translator Pro projects. You can upload as many project files as you like. In total, you should be able to install approx. 500,000 translations. How does MIDI Translator Pro work in the BomeBox? 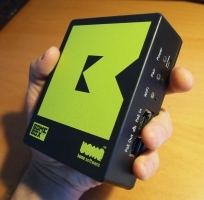 The BomeBox contains a runtime of MIDI Translator Pro. So you will use the MIDI Translator Pro software on a PC or Mac to create your project file(s), and then use the web config to upload the project. The BomeBox stores up to 8MB of project files, and the web config makes it easy to select the project you want to run. Note: Bome MIDI Translator Pro is not included with the BomeBox, see the next questions, too. Does the BomeBox keep the uploaded MT Pro Project Files when powered off? Yes, and that’s very important! There’s up to 8MB available for your project files, and when you power cycle the BomeBox, it just continues where it was when powering off and starts the last loaded MIDI Translator Pro project. 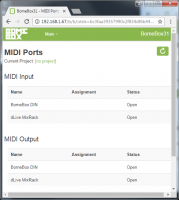 Which features of MIDI Translator Pro are available in the BomeBox? It supports all features not related to a desktop computer: MIDI in/out, unlimited MIDI ports, MIDI routes, MIDI aliases, Rules, timers, enable/disable presets. Not supported is e.g. keystroke emulation, AppleScript, mouse emulation. Does the BomeBox include a license of MIDI Translator Pro? 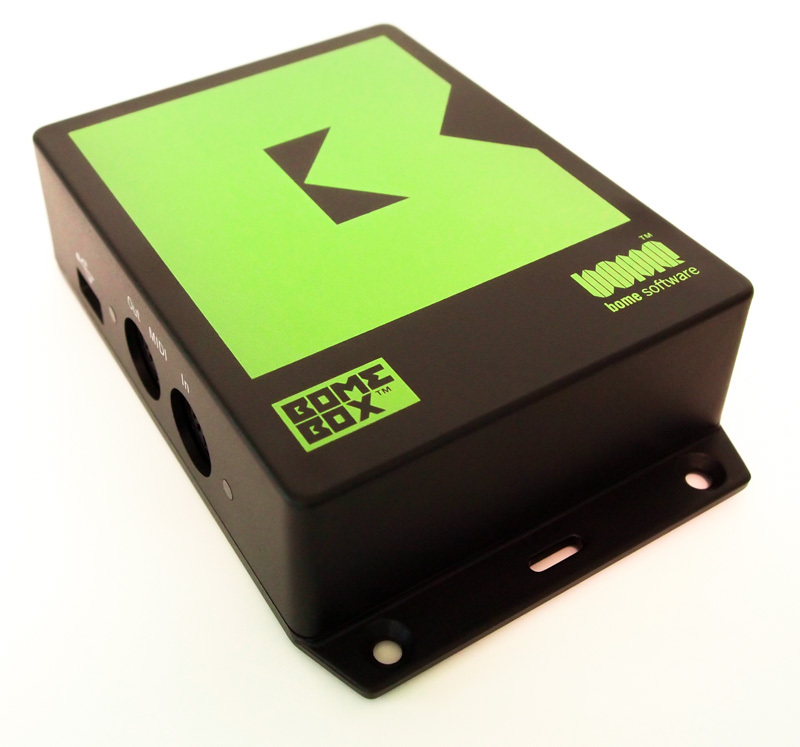 The BomeBox is priced very competitively, so it does not include a MIDI Translator Pro license. The BomeBox has a lot of functionality available in the web config, so for many use cases, the advanced mapping capabilities of MIDI Translator Pro are not even needed. And if you’ve downloaded or received a Bome MIDI Translator Pro project file, you can run it in the BomeBox without owning a license of MT Pro. Do I need a license of MIDI Translator Pro for running a project on the box? If you got a MIDI Translator Pro project file, for example from your technician or downloaded on the Internet, you can upload it to the BomeBox and it will run even without a license of MIDI Translator Pro. You only need a Bome MIDI Translator Pro license if you want to create or modify project files. 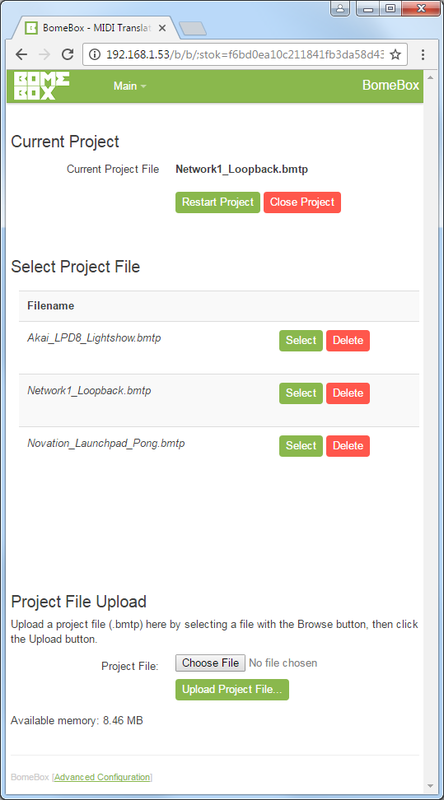 Project files created with the Trial version cannot be uploaded to the BomeBox. Does the BomeBox support Keystroke-to-MIDI translation? I.e. you attach a USB-QWERTY keyboard to the BomeBox and use it to trigger MIDI messages. This is supported since firmware v1.3.1. There is a generic translation project included with the BomeBox which maps every key on an ASCII keyboard to a MIDI note. But you can also create your own mappings using Bome MIDI Translator Pro. You will need to attach the QWERTY keyboard(s) to a USB hub. Can you translate game pads / joysticks to MIDI using the BomeBox? This is planned for firmware v1.4 along with Mouse to MIDI translation. Does the BomeBox support MIDI-to-Keystroke translation? I.e. you connect the BomeBox to a computer via USB and there, it appears as a QWERTY keyboard which can be triggered via translators in a MT Pro project in the BomeBox. This is not possible, because the micro USB connector is for power only. Maybe BomeBox 2… For now, you can do this by using the Bome Network tool (see next section), and running MIDI Translator Pro on the computer for emulating the keystrokes. Another way is to use the BomeBox’ Serial Port support: some devices can recognize a serial as keystroke input. Can I connect the BomeBox to a computer? 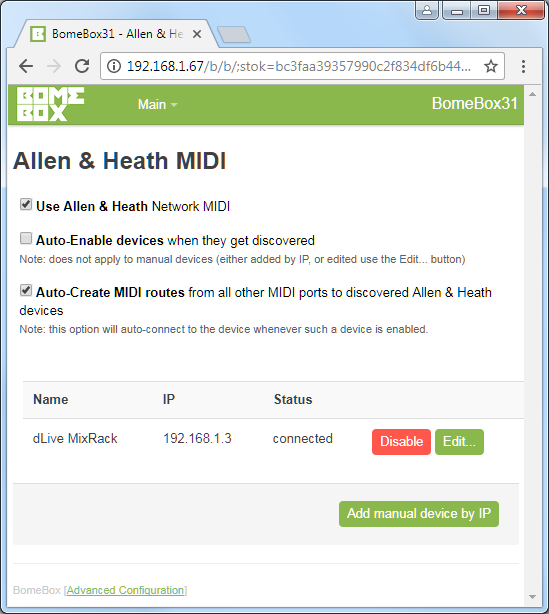 One of our goals for creating the BomeBox was to get rid of the computer… However, you can use our Bome Network tool for Windows and macOS for creating MIDI connections to and from a BomeBox via Ethernet or WiFi. See also the following questions. 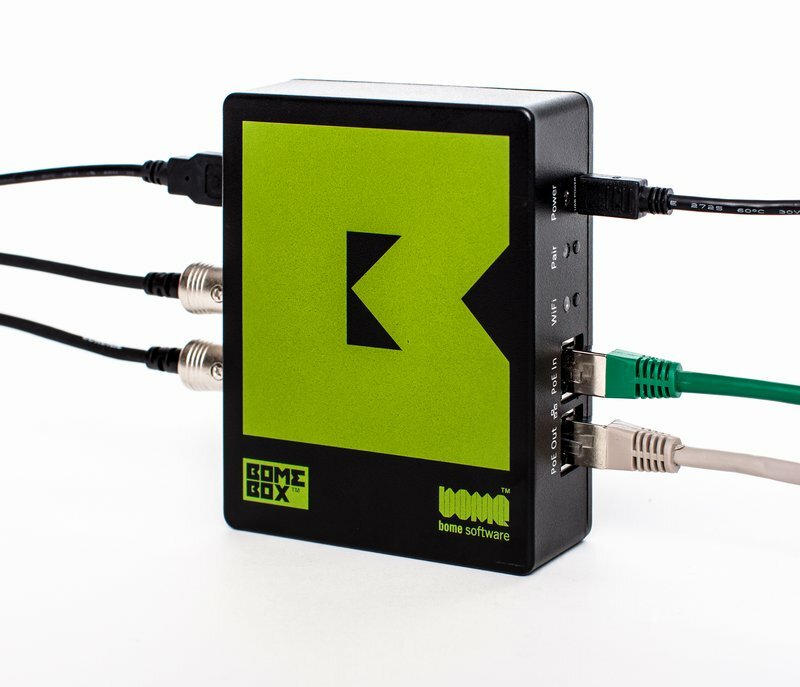 Can I connect to the BomeBox from iPad, iPhone, Android,…? The built-in WiFi makes it very easy to connect to the BomeBox from a smart phone or tablet. This is very useful for accessing the web config. 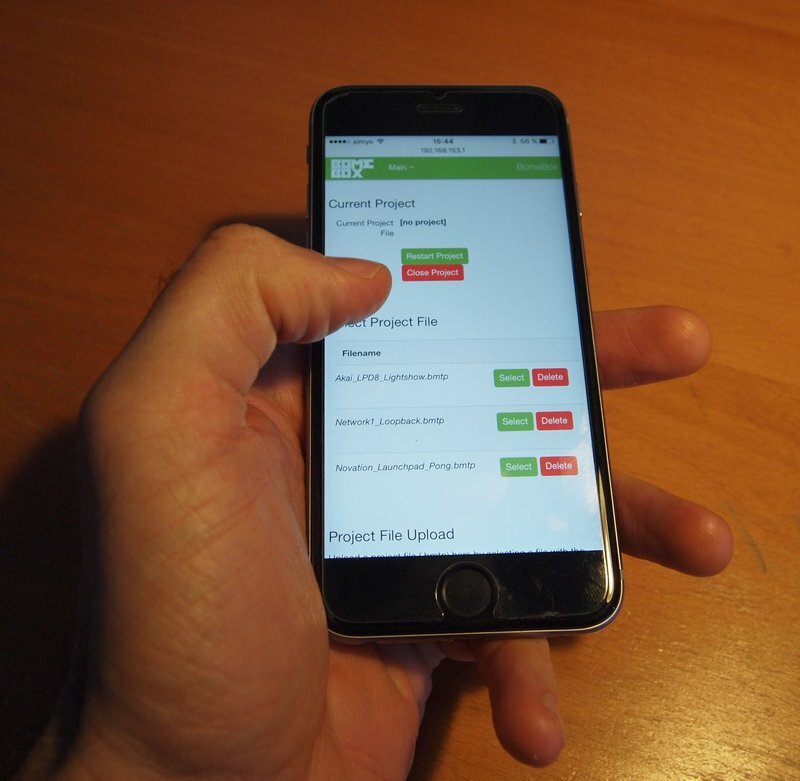 In future, we’ll provide the Bome Network tool as an app for mobile devices. 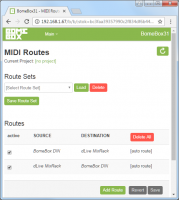 Note that currently, the BomeBox does not implement RTP-MIDI (as used by macOS and iOS). See also next question. Can I access all devices connected to the BomeBox from a computer? 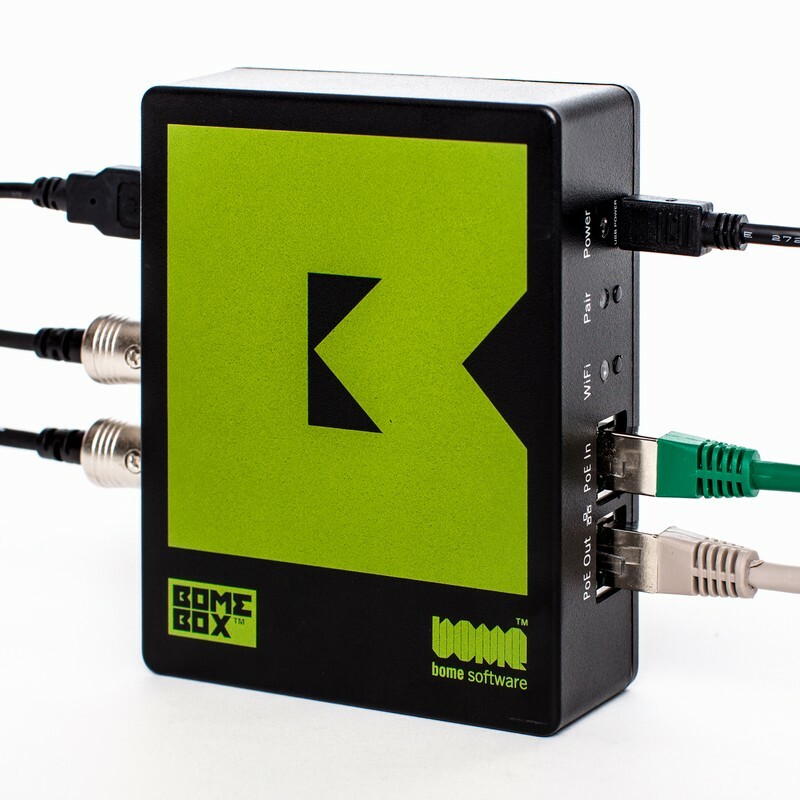 Currently, each BomeBox only provides one MIDI IN/OUT stream per computer connection. So if you want to access multiple MIDI devices connected to the BomeBox, their MIDI data is merged. Using channel mappings, you can separate each device, but you are limited to 16 MIDI channels. We’re working on a firmware update which allows you to individually create additional MIDI IN/OUT streams to individual MIDI devices connected to a BomeBox. Why doesn’t the BomeBox support RTP-MIDI (as used on macOS and iOS)? When we needed a networked MIDI protocol years ago, RTP-MIDI did not fulfill our requirements of performance and ease of use. So we developed an own protocol which is very easy to set up, has built-in security, and has very low latency. But we’re considering to add RTP-MIDI support in future with a firmware update. Does the BomeBox support OSC? In terms of OSC, the BomeBox currently just works as a router. So, for example, you can connect an iPad running an OSC app to the BomeBox via WiFi, then the BomeBox routes the OSC messages to and from any connected computer or device which the iPad app is configured to talk with. However, but we’re also working on OSC-to-MIDI mapping and have already shown a prototype featuring TouchOSC being connected to a BomeBox, converting OSC to MIDI, and driving a MIDI device connected to the BomeBox. So then you can control real MIDI gear from TouchOSC without a computer! OSC mapping support will be available as a firmware update. How does the BomeBox connect to Allen & Heath Mixers? Allen & Heath mixers of the dLive, Qu, GLD, and SQ series can be connected via Ethernet (other series like iLive may work, too, but only by manually connecting by IP address). 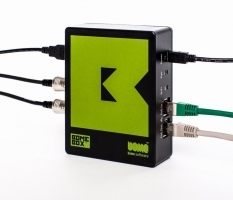 The BomeBox detects any connected mixers and will let you use them in the internal MIDI router. So you can use MIDI devices connected to the USB or DIN ports to talk to the Allen & Heath mixers — without a computer. Can I connect to devices with a Serial Port? Yes, just attach one (or more) USB-to-Serial adapter to the BomeBox, and use a MIDI Translator Pro project to set up the translation from/to MIDI. 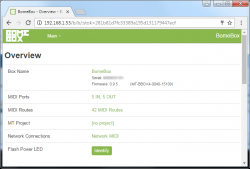 The web config allows assigning the correct serial ports to the ones defined in the project. How can I configure the BomeBox? The BomeBox is configured via the Web Config, accessible from a browser via Ethernet or WiFi. This works similar to how you configure an Internet router. Click here for a few web config screenshots. Can I access the Web Config from a computer? 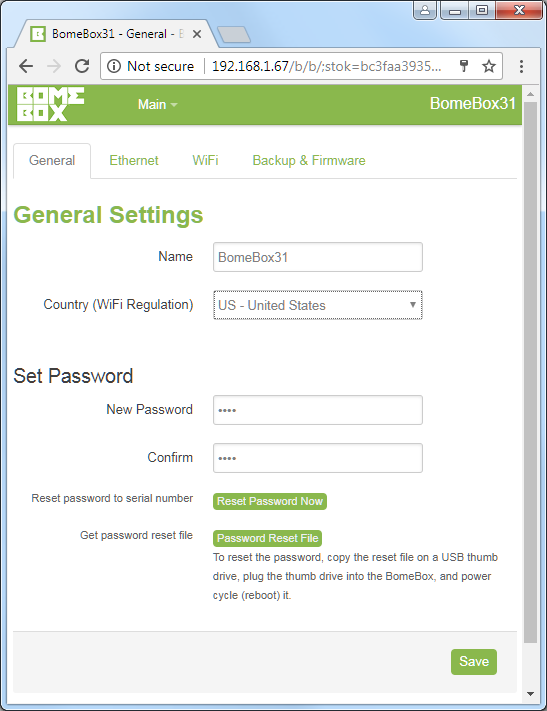 Yes, just open the browser and enter the IP address of the BomeBox. When connected via WiFi, the IP address is 192.168.153.1. When using the Bome Network tool, it displays a menu entry for directly opening a browser with the corresponding BomeBox web config page. Can I access the Web Config from a smartphone or tablet? Yes, and that’s our recommended way: use Ethernet for Network MIDI (if needed), and WiFi for web config from a tablet. 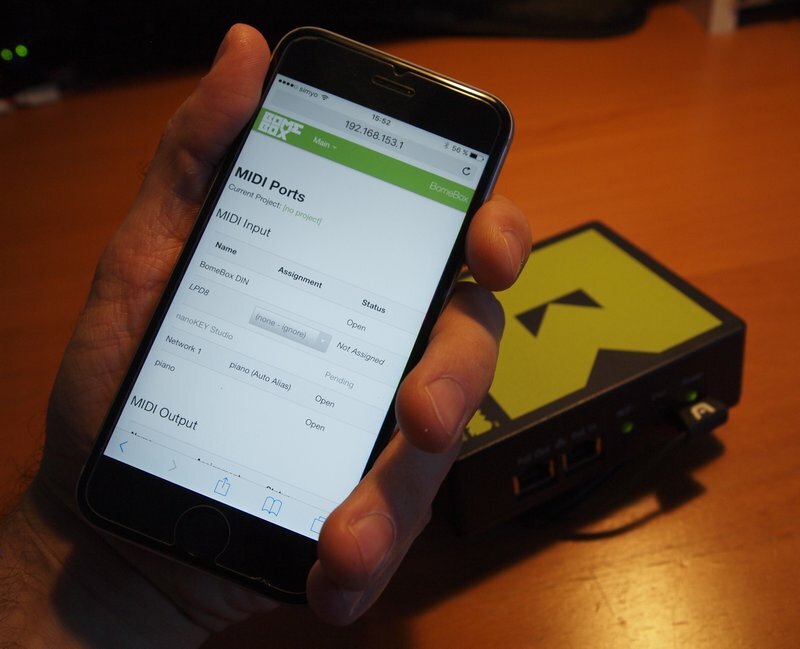 Simply connect to the BomeBox WiFi (by default SSID “BomeBox”), open your mobile browser like Safari or Chrome, where you will be greeted by a BomeBox status page. If you don’t get routed to the web config, enter the IP address 192.168.153.1. What can I configure in the Web Config? Can I connect multiple devices to the BomeBox via WiFi? Yes, by default, the BomeBox works like a wireless WiFi router. Can I connect the BomeBox via WiFi to an existing WiFi router? Yes, simply select “WiFi Client” instead of “WiFi HotSpot” in the web config. Can I use WiFi Ad-Hoc connection? No, and it won’t be necessary, because the BomeBox works as a full WiFi HotSpot. Does the BomeBox support Bluetooth? 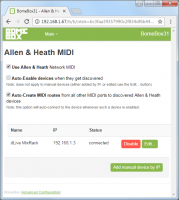 There is no built-in Bluetooth in the BomeBox, but you can plug in a Bluetooth-MIDI dongle like WIDI-Bud for connecting Bluetooth MIDI devices to the BomeBox. Can I connect two BomeBoxes without a network router? Yes, this is possible via Ethernet and WiFi. 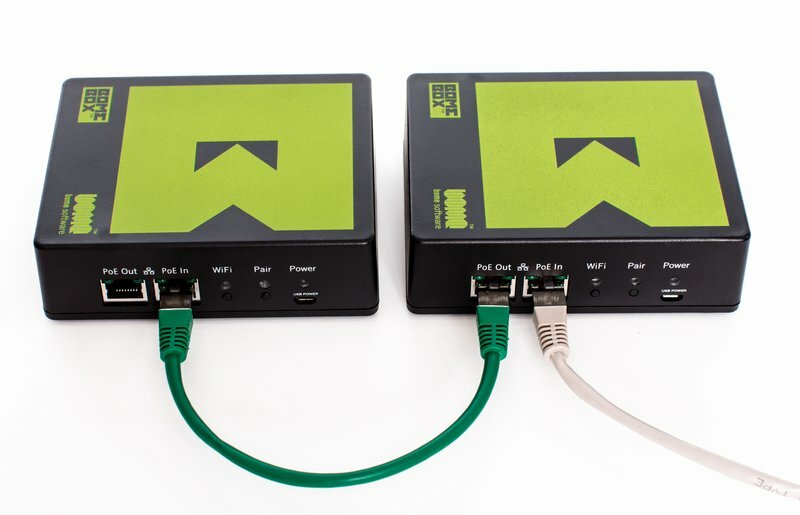 For Ethernet, simply use a standard network cable to directly connect BomeBoxes. The network ports are MDIX auto sensing and support APIPA/link local addresses. Additionally, you can enable a DHCP server in a BomeBox (Ethernet Master) and use a switch to connect even more devices. It’ll serve other devices like computers, too. For WiFi, you can set up a BomeBox as a WiFi Client, or as a WiFi Hotspot, so you can also create connections from one BomeBox to another. Do I need a network router for using the BomeBox in a network? 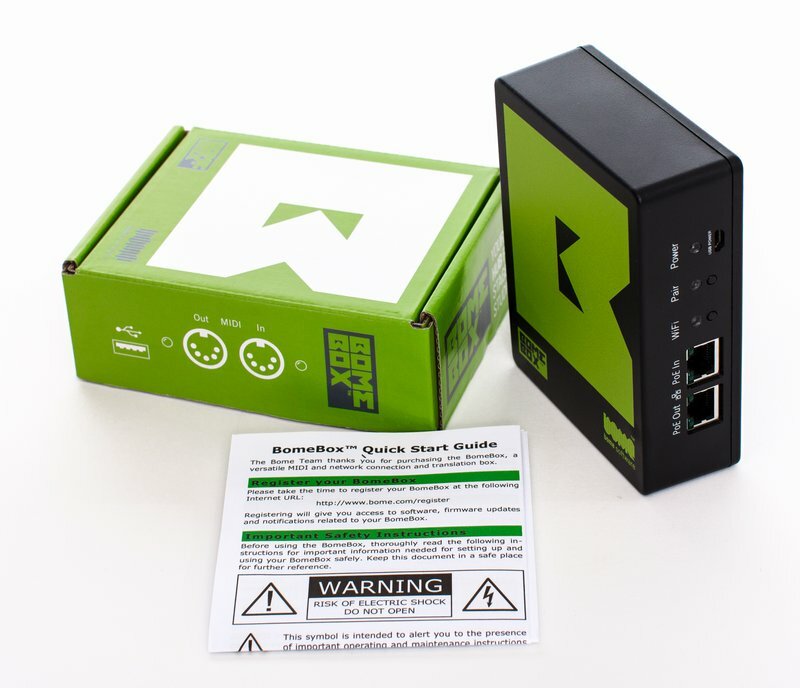 No, the BomeBox has all the functionality of a router: it features a DHCP server, so you can run all your network on your BomeBox. 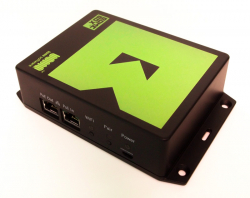 However, a BomeBox will also fit well into networks with an existing router. Why are there 2 Ethernet ports? 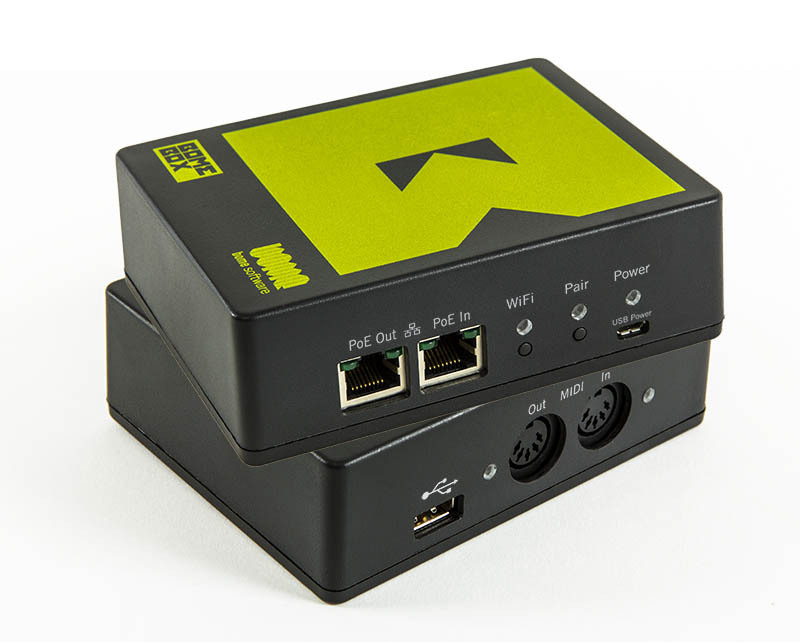 Apart from PoE (see below), they work like a mini network switch, so in many cases, you will not even need a network switch or router when using the BomeBox. 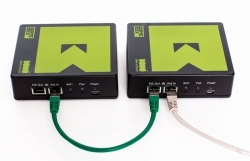 Another great way to connect BomeBoxes are to daisy chain them: one network cable connects to a second BomeBox, which connects a third BomeBox, and so on. In conjunction with PoE, you will not even need to attach a power adapter to the BomeBoxes. Why are the network ports labeled PoE In and PoE Out? PoE In is for getting power into the BomeBox: use any PoE source for that. The PoE Out port works as a PoE source for a daisy chained BomeBox. By daisy chaining, you can, for example, connect all the BomeBoxes on a stage setup with just one cable connection for providing power and Ethernet MIDI connections. How can I prevent an intruder to access the Web Config? Can someone connect via Network MIDI without authorization? No, Network MIDI connections require a two-step setup: one side requests a Network MIDI connection, and the other side must approve it. 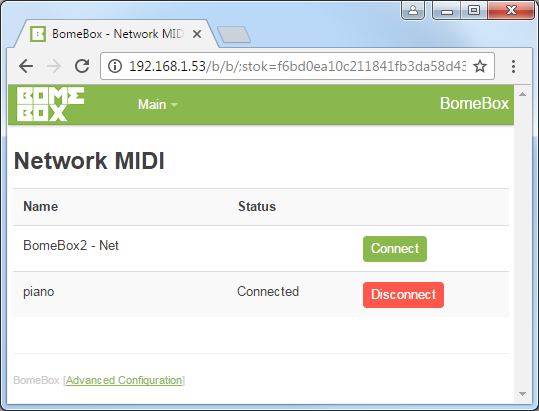 For convenience, you can use the Pair button on the BomeBox to authorize an incoming Network MIDI connection request. 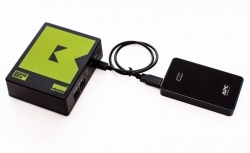 The BomeBox provides a way to reset the password: copy the password reset file on a USB thumb drive, plug the thumb drive in the BomeBox USB port, and then reboot the BomeBox. This will revert the password to the default (serial number) for access to the web config. I misconfigured the BomeBox network and cannot access it anymore! Similar in the way to reset your password, use a thumb drive with a special network reset file and reboot the BomeBox. This will reset the network to factory defaults (Ethernet client, WiFi HotSpot without password). 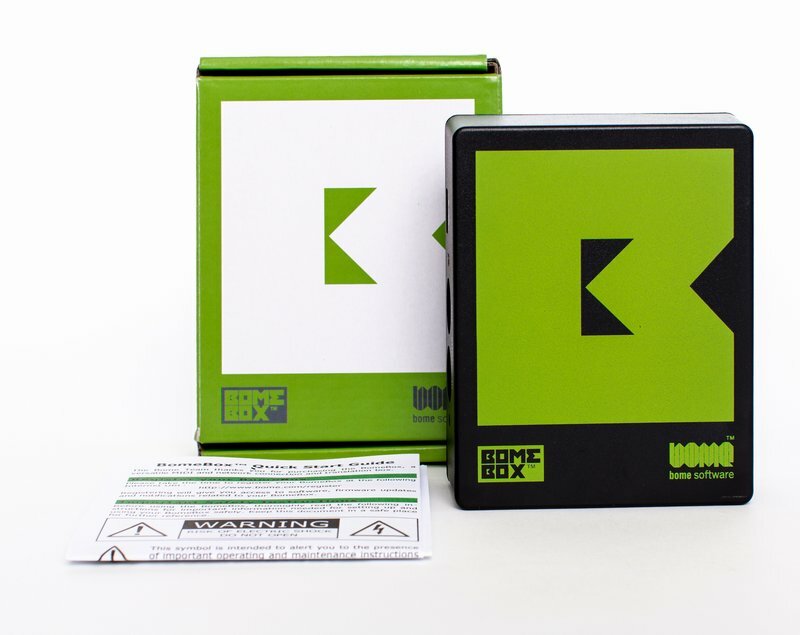 Why is the BomeBox made of plastic? Using a metal case would have been nice, and not even more expensive. But with a metal case, for the WiFi to work, we would have had to use an external antenna! So we settled on an internal antenna and a particularly robust non-flammable ABS plastic case, enforced with a metal bolt in the center for extra robustness. Is there an option for a more robust power supply than Micro-USB? Yes, in that case you should power the box via Ethernet. The Ethernet jack is protected against involuntarily pulling out the cable. A standard 48V Power-over-Ethernet injector for will work fine, like this Digitus PoE Injector. Or a PoE switch with multiple ports. You can use such PoE power sources as a power supply even if not using Ethernet. Is the BomeBox Open Source? Not entirely. 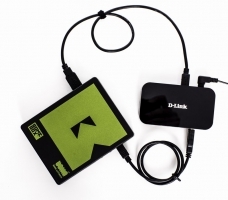 But the BomeBox runs an adapted version of OpenWRT, which is licensed under the GNU Public License. As required by the license, we have published our modifications to OpenWRT on github, so it is possible to create your own version of OpenWRT to run on the BomeBox, if you wish (without Bome specific functionality). Yes, and we recommend it. The BomeBox ships with a Pong MIDI Translator Pro project for use with a Novation Launchpad. It is a 4-sided Pong.